Psychology researchers at Glasgow University say they have increased the accuracy of automated face recognition to 100 per cent. If the claims are true, this development will have far-reaching consequences for privacy and security in modern society. Mike Burton, Professor of Psychology at Glasgow, and lecturer Rob Jenkins say they achieved their hugely-improved results by eliminating the variable effects of age, hairstyle, expression, lighting, different camera equipment etc. 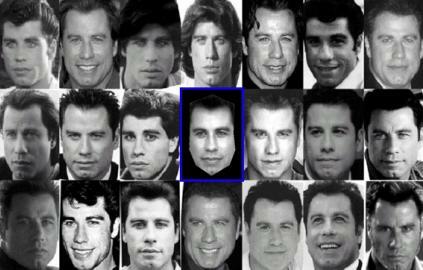 This was done by producing a composite "average face" for a person, synthesised from twenty different pictures across a range of ages, lighting and so on. An "average face" produced from a typical rogues' gallery. The Glaswegian psychologists may be hot stuff at face recognition, but plainly aren't engineering types - an engineer who said he'd produced a system with 100 per cent reliability would be laughed out of the room. In this case the duo mean that their system got it right every time in their tests, not that they have actually increased its accuracy to 100 per cent. However, if they have genuinely achieved something above - say - three or four nines, that could be very significant. The British security hierarchy has recently called for the nation's wide but unconnected CCTV coverage to be upgraded, expanded and - most significantly - centrally accessible. Combined with reliable automatic face recognition, such a system would allow the location and tracking of individuals en masse. Provided they weren't wearing their hoodies up, of course, as one might expect in many cases. In the end, the claim of 100 per cent accuracy is obviously an exaggeration - and that tends to diminish the credibility of the research. Still, the averaging technique could well give automated face-spotting software a boost nonetheless. It may not be long before criminals get 20 snaps or more taken under different lighting conditions, rather than the standard mugshot. Not that average-image CCTV scanner systems of the future would necessarily need such police files. Burton and Jenkins claim to have achieved good results using compilations of snaps culled randomly from the internet in many cases.